Karuta is a traditional Japanese card game around a theme such as poems, proverbes and geography. We use sentence cards and the matching cards (for examle with picture) to play karuta. 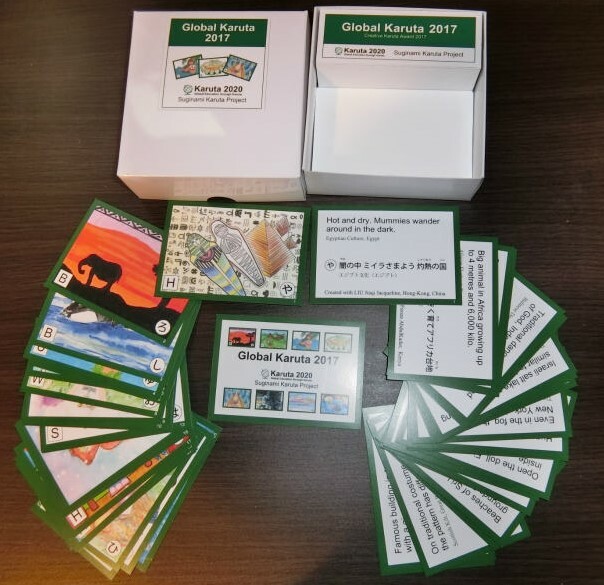 The below photo shows a set of karuta cards themed around various countries. This is the prize for the Creative Karuta Award 2017. It has 26 sentence cards on the right and 26 matching picture cards on the left. 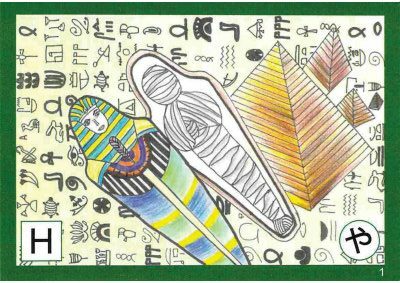 The below shows an example of sentence and mathing picture card on a subject, ‘Egyptian Culture’. 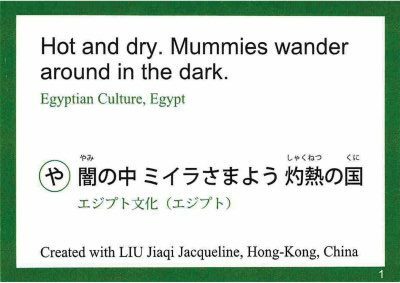 The picture and English sentence were created with the Award winner in HongKong. And the contest office created, added the Japanese sentence. So you can play karuta in English or Japanese or both. 1. Spread picture cards face up on mat. 2. A card reader holds all sentence cards and players can’t see them. 3. First the card reader reads aloud a sentence. For example, “Under blue sky, dance slowly with waves “. 4. Players listen for clues to find the matching picture card. 5. A quickest player to touch the matching picture card wins the card. 6. The winner is the player with the most picture cards at the end of game. What are clues to find the matching picture card? There are two kinds of clue. One of them is the information which the sentence gives. For example the sentence says ‘dance’, ‘waves‘ and your can find the same thing in the picture of ‘Hula Dance’. Another clue is the first letter of a sentence. For example, ‘U’ is the first letter of the sentence, “Under blue sky…. “ and ‘U’is printed at the left bottom corner of the ‘Hula Dance’ picture.